A swim meet is a swimming competition between individual athletes or between two or more swim teams, organized by a swimming organization or governing body. Swim competitions can be held in indoor or outdoor pools. Some swim meets also include a portion for relays, where members of the same team compete in groups against groups from opposing clubs. The goal of competing is to complete your swimming event as fast as you can. 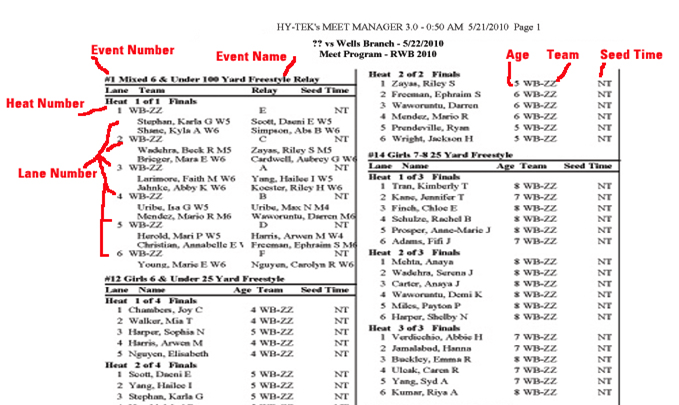 The meet information sheet contains all the information you need to enter a meet, including but not limited to the time and location, events you can swim, entry fees, and deadlines. It may also tell you how the meet will be run, how you will be timed, how awards will be presented, and provide information about the hosting facility. Meet information sheets can usually be found online at www.swimscotland.co.uk . Electrical equipment designed to measure the elapsed time between the start and finish of a race in each lane. An event is a portion of a meet competition broken down by distance (50, 100, 200, 400, 800 and 1500m), stroke (freestyle, backstroke, breaststroke, butterfly or I.M.) and oftentimes by age, gender and relay type. An event is the type of swim race you’ll be competing in. You will typically swim 1-5 events in a swim meet. You will never swim every event in a swim met. Most swim meets number their events according to session, typically 1-4 representing Saturday (sessions 1 and 2) and Sunday (sessions 3 and 4). In each event, there can be many swimmers competing. Depending on the size of the pool, only a limited number at swimmers can race at a time. If a pool has 6 lanes, then 6 swimmers will race in the event at a time, which is called a “heat.” If there are 60 swimmers competing in the 100 freestyle event, then there will be 10 heats. Typically, the swimmers with the slowest seed times will swim in the first heat, ending the with fastest swimmers in the last heat. Some formats use a circle seed, where they mix up swimmers with fast seed times with slower seeded swimmers in each heat. Keep in mind that just because you were faster than the other 5 people that swim next to you, you may not have won the event. Be sure to check the official results sheet to see where you placed. The swimmer’s fastest time prior to this meet. Seeding is the method of placing swimmers in lanes in order of their entry times. A ranking of swimmers by event and time. This is your assigned lane in the pool that you will be racing in, during your heat. Typically, the fastest swimmers in each heat get assigned to the middle lanes. Lanes are numbered from right to left as the swimmer stands facing the course. This is where you find out what you’re swimming, when, and where. Most meets print these out and tape them on the pool walls. Some even sell them at the door for a modest fee. You can either compete in an individual event, where you swim a race alone, or you can compete as part of a relay. A relay is typically a combination of 4 swimmers on the same team. Each swimmer takes turns completing parts of the race, typically 1/4 of the total distance. Relays are usually either freestyle, or a medley. A 200 freestyle medley means that swimmer #1 swims 50m freestyle, then swimmer #2 immediately swims the second leg, then swimmers #3 and #4 swim legs 3 and 4 consecutively. The fastest swimmer is responsible for the last “leg” of the race, and the entire group’s time is the final result of the race. A medley is similar, but each swimmer is responsible for completing a different stroke of the I.M. Swimmer #1 does backstroke, swimmer #2 does breaststroke, swimmer #3 does butterfly, and swimmer #4 does freestyle. A portion, normally one-quarter of an individual or relay event. 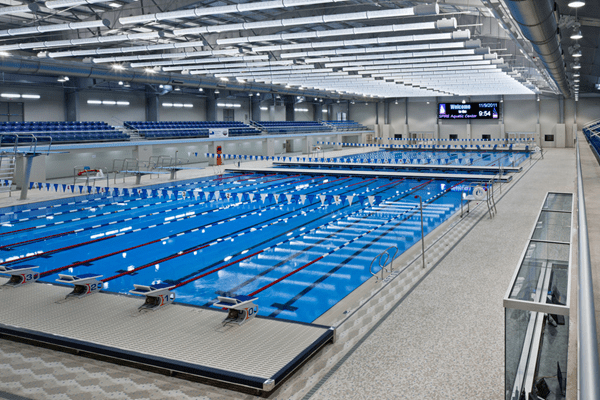 The term short course (SCM) is used globally, to identify a pool that is 25 metres in length. A pool configured for swimming with a 50-meter long race course. Slang for Individual Medley, an event in which the swimmer uses all four competitive strokes in the following order: butterfly, backstroke, breaststroke and freestyle. A judge on the deck of the pool. Various judges or officials watch the swimmer’s strokes, turns and finishes or are timers. A split is the exact second that divides one lap from another. Split time is the amount of time that adds up between two splits. A timer can record a split after one lap — the length of the pool; two laps — down and back — or any other distance he chooses. Calculating split times in swimming is a means of calculating an individual swimmer’s or relay team’s pace over a series of laps. Recording splits and calculating times is useful in determining what legs of the race are covered in what amount of time. Example: if your final time for a 100 freestyle is 1:10, your 1st split (first 50m) can be :30 seconds, and your 2nd split (second 50m) would be :40 seconds. The touchpad is the area at the end of each lane in the pool where a swimmer’s time is registered and sent electronically to the timing system and the scoreboard. This touchpad is very sensitive and works best when you push your fingers into it aggressively at the end of your race to ensure your split is recorded. The recorded time from a watch started and stopped manually by a lane timer. At most meets, stroke-and-turn judges observe the swimmers to ensure that the starts, strokes, turns, and finishes are performed according to the rules. A DQ is a disqualification from an event. If you are disqualified in a race, it means that you have broken one or more of the rules designated for that stroke or for that event. You will be notified of your DQ after your race, and you will not be able to place to win a ribbon or medal. Examples include: jumping off the diving block before the horn is blown, wearing illegal equipment like fins, swimming the wrong stroke in a heat, doing a flutter kick in a breaststroke event, or grabbing on to a lane rope. Disqualifications can be seen as a sad or horrible thing, but it is not the end of the world! It’s often a great learning experience and is a big motivation to learn how to compete properly. Scratching an event is declaring that, while you are at the meet and intend to race, you will not be participating in a particular race. It can also refer to occasions when a meet is oversubscribed and swimmers with slower times will not be able to swim. Used by the swimmer before the race to get their muscles loose and ready to race.